This program features newly commissioned works by four Brazilian composers. Marcos Balter and Felipe Lara write music brimming with densely beautiful structures, while Daniel Puig and Tania Lanfer test conventional limits of sound and space through electroacoustic compositions. Also featured are new works from Mexico and Argentina. This evening's concert pairs two musical revolutionaries, separated by centuries: Franz Schubert and experimental jazz and electronic music pioneer George Lewis. Both Schubert’s Octet—scored for eight players, yet symphonic in scope—and Lewis’ dynamic and ever-shifting interactions between players elevate chamber music to new levels. With 33 instrumentalists performing in forces ranging from solos to large ensembles, the International Contemporary Ensemble (ICE) is dedicated to reshaping the way music is created and experienced. 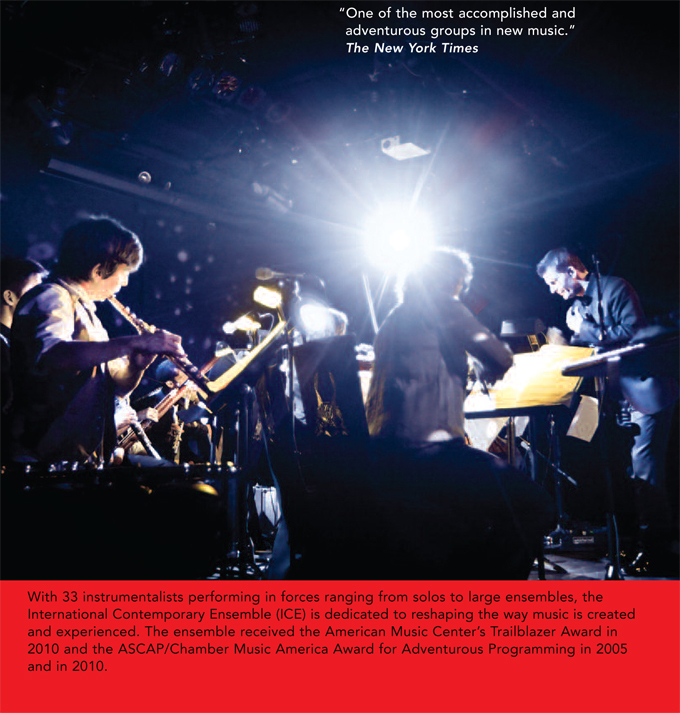 The ensemble received the American Music Center’s Trailblazer Award in 2010 and the ASCAP/Chamber Music America Award for Adventurous Programming in 2005 and in 2010.